Ben’s quilts may not be everyone’s cup of tea. The subject matter is very punk rock/heavy metal/tattoo/biker culture inspired. A pretty far cry from traditional quilt designs, the new modern quilt genre, or the fun and sweet patterns that are stocked at your local quilt shop. 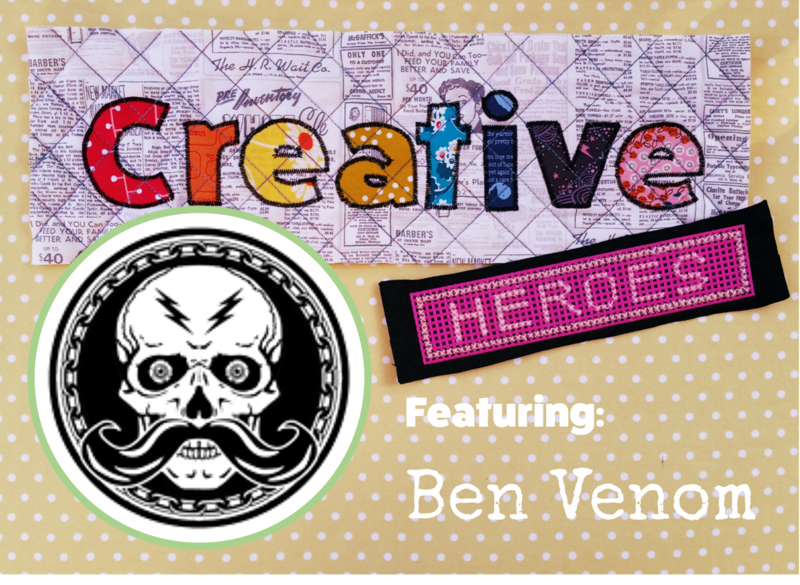 But Ben’s inspiration is far from counter-culture: the Quilts of Gee’s Bend deeply inspired him to not only try quilting, but to incorporate upcycled materials into his work. His quilts are literally a patchwork of denim, band t-shirts, bandanas and other recycled material. This is one of Ben’s older pieces – but one of my favorites! After drooling over his work for about a year, I was, of course, interested in how he manages his time. He’s pretty prolific, making not just quilts (many of which are fairly large) but also putting his trademark applique on denim jackets and vests. Plus his Instagram feed is full of other people’s work! So I knew he spends a fair amount of time at gallery shows, exhibits and studio visits. Ben: My studio is located in the back room of my wife’s and my apartment which allows me to work all the time. I work a part-time job during the week and spend the rest of my time in studio…including weekends. Friends of mine joke that I am under self-imposed house arrest when I am getting ready for an upcoming exhibition. Ben: I wake up around 8am, make coffee, check email, then start working. Around 2pm, I will break for a quick lunch then back to work until about 7pm when my wife comes home from work. C+M: As a working artist, do you have a particular way that you manage your schedule? Ben: Lists! I have multiple lists with important dates/projects highlighted that I have taped to my studio wall. I also enter deadlines into my iphone with alerts. Ben: Motivation and a desire to succeed will always allow for anything to get done regardless of time constraints. I just finished a very detailed 5’x 8’ piece in record time for a group exhibition that opens next week. For the last 5 weeks I worked on this piece non-stop and was worried I would not be able to finish on time. Luckily I finished with a few hours to spare. C+M: Do you have any suggestions or best practices for people who are trying to deal with balancing their creative work with a regular 9-5 job? Ben: Find a job you can tolerate that makes you decent money but does not detract from your creative energy. I am visiting faculty at the San Francisco Art Institute where I teach critique seminars for graduate students. This job allows me to be involved with other artists and discuss art on a regular basis while not taking away from my creative time. C+M: Have you ever struggled with procrastination, disorganization, or other productivity challenges? Ben: Recently I heard via a podcast that procrastination can actually be a positive form of the creative process by allowing you to let your idea sit and grow. Only under pressure will some people start producing their best work. For me it depends on the situation and project. What do you do if it becomes an issue? I basically try to be patient and not get to stressed. Although, I have to admit my studio is a hurricane of disorganization! Ben: I make a very strong and continued effort to stay positive. C+M: Anything else you would like to share with Creative + Mindful readers? I hope you have enjoyed this installment in my Creative Heroes interviews. Big thanks to Ben for taking time out to answer my questions! Want more Ben Venom? Check him out on his website or on Instagram. And be sure to take a peek at his press page for videos of him at work in his studio! ← Christmas in July?! Yeah… there might be something to this.